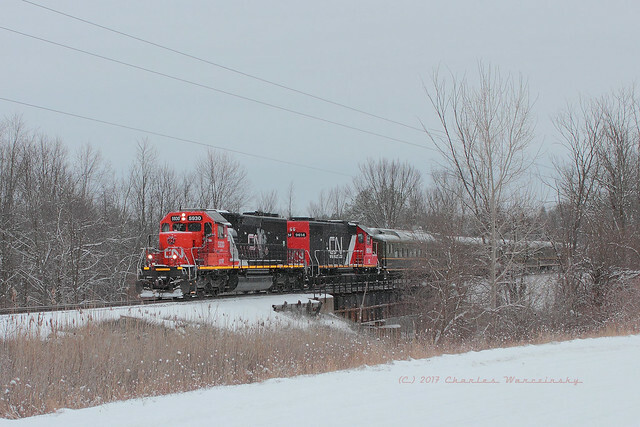 In what has become a yearly tradition for me, I was able to capture the 2017 version of the Grand Trunk Western Santa Train crossing the Pine River in St. Clair County’s Kimball Township. Unlike many years in recent memory, the 2017 edition featured a Grand Trunk Western locomotive on the point. 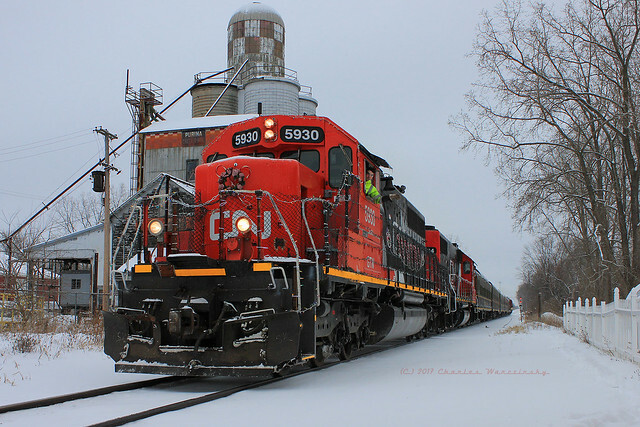 Unusual for this year was that the GTW locomotive was GTW 5930, one of the road’s few remaining SD40-2s, albeit wearing parent Canadian National’s CN North America paint scheme (featuring an outline of the entire North American continent on the long hood). Also unusual this year was the speed restriction placed on the train. In every year I can recall catching the train, the train was moving at, or close to, the maximum passenger train speeds for the line. Passenger train speed limits tend to be higher than freight train speed limits. This year, the train was moving slowly enough to allow for a chase, despite falling snow that had made several roads along the route barely passable. As a result I and others were able to see the train pass in more than one location. Even though I dallied getting back to the car and back on the road, planning to stop at Menards’ to pick up several things for projects around the house (yes, I still shop there and I even prefer shopping there over the rest of the local big box stores), when it came time to turn back toward town and the projects I had to get working on, I turned south toward Richmond and points south, figuring I just might be able to catch the train at Richmond. All photos in this post were taken 16 December 2017, but this turned into the 2nd of 3 times I’d catch the train on this particular weekend. I’ll have another post (eventually) covering the various Santa (and other) trains I caught with a couple friends on 17 December 2017.